I recently found a very interesting discussion on Reddit about welfare programs. Someone asked if the US would save or spend more money if they cut all the current programs and changed to a flat-rate, guaranteed minimum income system, click here to read the full Reddit post. A user, by the name of imkharn, responded and has received over 2241 points over the last seven days. His words really hit a chord with me. I will admit that I’m not smart enough in this area to have all the answers, so I’ll try just to present information that is coloured with a few of my own personal experiences. Not all money given to the poor counts as welfare. The government has a much more restrictive definition allowing a much lower cost quote. If you include earned income credit and housing assistance, spending on the poor is 1.03 trillion a year. Keep in mind this may be a little high because not all welfare money goes to the poor. This means it would be cheaper for the US government to simply cut a $22,000 check to every adult in poverty each year than keeping the current 80+ program welfare system. A more efficient use of that 22K is to give it out in graduated amounts. Ensure no one makes less than 22K a year, but if they make more than 22K a year, for every 2 dollars of additional income they make, remove 1 dollar of subsidy check. This smooth transition doesn’t remove incentive to get a job and was proposed by Nobel laureate economist Milton Friedman who despite being a libertarian supports a minimum guaranteed income. 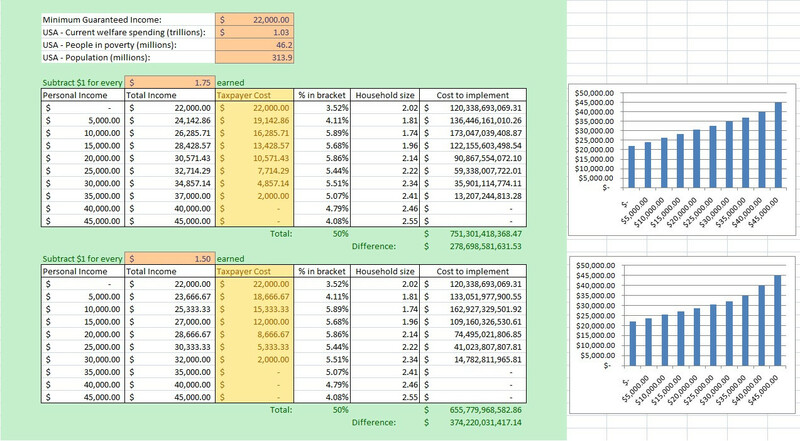 Here is a cool spreadsheet image showing what different systems would look like using a similar model and comparing the current costs mentioned in the links in imkharn’s comment. The need for such a system, at least in my mind, really drives home the issue with our economy, but much like minimum wage, I think this idea’s time has definitely come, and a more simplistic, standardized system could be beneficial, easier to maintain and while it would suffer from people gaming the system or outright lying, we have those issues in our current social assistance programs. I would love to see how the numbers would stack up in Canada. I don’t know if $22,000 is the right amount, but currently if someone in Canada worked a minimum wage job ($10.25/hr) for 40 hours per week, for an average of 48 weeks per year, they’d have $19,680 pre-taxes or probably around $15,000 per year after taxes which means surviving on $1250 per month. I couldn’t make that work here in Georgetown. My rent alone would take two thirds of that amount, and I live in a worn down, low quality bachelor apartment. Under such a system, that same person, would have nearly $30,000 guaranteed. They would have around $2500 per month to spend on an apartment, clothing, food, services, and could thrive in a much more normal way. The money they would spend on goods and services would help the economy, and the government would save money from not having to manage such a complex system, and get a piece of the action back in sales taxes from purchases. There are a great number of awesome comments within the post, and it is definitely a must-read if you have any interest in this topic. My hope is that more people can start trying to develop systems to help society get back on track. Unfortunately this system, like nearly any single idea, won’t help the income disparity between the highest and lowest earners in the economy, but as one person said, a system like this could mean the difference between surviving on a minimum wage job, or thriving. We definitely don’t live in the world that my parents or grandparents lived in when it comes to wages versus expenses. I am super fortunate to have a pretty darn good job for an amazing company, but I still struggle sometimes thanks to financial mistakes made earlier on in my career.